Our family watches a TV show and an actor or actress appears on the screen. We think, Hey… who is that? What were they in? It niggles at my brain and I need to know! So I pull up my trusty movie database app, and find out who it is and where we’ve seen them. When is that package arriving? No problem. I check the online shipping schedule, and can know within a few hours when a package will arrive at my house. I run across a new word in my new novel. I simply hover over the word, and instantly the definition is displayed. Not too long ago I was at my parents’ house visiting with my dad. He asked a question that I didn’t have an immediate answer for. As I reached for my iPad, my dad said, “You’re going to look that up, aren’t you?” I said, yeah! He shook his head. I just read a Facebook post about some friends who are visiting the Grand Canyon. They posted that they were googling how many people per year die at the Grand Canyon. With any and all kinds of information at our fingertips, we have become a society that is in the know. Sometimes I feel like I’m in a race to keep up with one friend who knows more about one subject, and in a race with another who knows more about a different subject. All the while, I feel smug about the subject for which I am the expert. It shouldn’t surprise us, though. I was talking with my friend, Sheri, about this, and she immediately reminded me of Adam & Eve’s choice to eat from the tree of the knowledge of good and evil. They chose knowledge over life. Then the Lord God planted a garden in Eden in the east, and there he placed the man he had made. The Lord God made all sorts of trees grow up from the ground—trees that were beautiful and that produced delicious fruit. In the middle of the garden he placed the tree of life and the tree of the knowledge of good and evil … the Lord God warned [Adam], “You may freely eat the fruit of every tree in the garden—except the tree of the knowledge of good and evil. If you eat its fruit, you are sure to die.” (Genesis 2:8-9, 16-17). Lately, I feel like this need to know has become an insatiable drive for me. And it’s not healthy! Is it just me? Is anyone else out there feeling this same pull? So I find myself asking, Do I really need to know this piece of information? Do I need to know it at this moment? Can I walk away from it? The Internet can be our best friend when we truly need information. And we all do from time to time. But it can our enemy when our need to know information eclipses our need to know people. In our instant-gratification culture, that’s not always (dare I say usually) the case. Last weekend I attended DECLARE, a social media conference for Christian women bloggers. Friends were talking about Genesis–the end-all-be-all platform for building websites. My friend, Tammy, just moved her site onto the Genesis Framework. All the cool kids are doing it. I want in, too! After browsing the website and all the nifty themes, I quickly learned that it requires a good deal of mental focus. At DECLARE, God showed me that I need to focus my energy in other areas. Like finishing the Bible study I’m currently writing! Soon it will be in beta, and hopefully by this time next year, it will be published! Maybe then will be a better time to look at a website redesign. So I purposefully closed that browser window. As a result of all this, I’ve decided to wean myself off of unnecessary information. What about you? Do you quickly reach for your device to search out that bit of information you need to know? Is it truly necessary for you to know? Right now? An even more important question, how quickly do we reach for God’s Word when we are flummoxed over an issue in our lives? His Word certainly has the answer. And it’s the answer He wants us to have. Right now. God often engineers circumstances that drive us to His Word. Yes! And when the Holy Spirit illumines our hearts with truth–we must respond. But when it’s just information, or information for later, it’s OK not to know. It’s OK not to do. It certainly makes me think about my choices! This is SPOT ON, Dianne. I realize how often I hit that facebook icon on my phone during the day, and really it just adds to mental and spiritual clutter, doesn’t it? I agree, Betsy … it’s almost anxiety-like. I like your adjective … “clutter” … which I hate! Love you, friend. This is so accurate! Especially in this crazy blogging world. I find email and feeds filled with the free course I can take to be better at, to know more, to get that deal. I am flooded. With good things, but flooded nonetheless. And here’s the truth: Oversaturated ground will not produce fruit. Seed will die. There is no life there. So, I’ve taken a step back. I’ve gone back to the start: God, and asked Him (actually begged Him) for direction, for where to focus my energy and time and learning. And He’s showing me. It will be different for each of us. But He will show us and answer us. We don’t need to know it all, we only need to know Him. Visiting from Dance With Jesus linkup! I get it with the courses! There is ALWAYS something new to learn! In fact … I have a few in my inbox that are just sitting there! I’m praying with you that God will show you very clearly where He wants you to focus your energy! It really is interesting how much one can find on the Internet. Very thought provoking post. Yep … it can be good for us … or distracting! I am an information junkie! I love reading and being in the know, but it is exhausting and can often pull me away from more important things. I’m with you – I need to step back and simply be. I’ve been learning about true rest in Christ & the freedom that comes from accepting grace for ourselves. Your post took me back to those principles. It is not about being in the know with the latest information – it is about resting in Christ. Always. Thanks for sharing your heart! Yes! And when you are “in the business,” it’s so much harder to stay away from it! Thanks, Dianne for this reminder. I needed (yep, I went there) to read this. I know I struggle with Letting go of the ‘Need to Know’. I agree that God has created us with the desire for knowledge. And just like anything else God has created, the enemy of our souls wants to trip us up by getting our focus off of knowing God and His wisdom, which brings life, and detouring us into the fruitless search for man’s knowledge and wisdom (no life there). What a great reminder that the one who created us and is the source of all wisdom and knowledge has revealed Himself to us. I love what Paul wrote to the Corinthians. Beautiful Scripture, Sheri … thank you for adding this rich word! Love you!!! Thanks for sharing this point-blank, Dianne!! Oh, Bethany … I ned a sign like that on my desk as well! Thanks so much for coming by today. Such a great post, Dianne! I can’t remember what movie it was (and I probably wouldn’t recommend it anyway) but my Honey and I watched a rented movie awhile back and one of the main characters was hipster cool and whenever anyone would grab for their phones to Google something, he would stop them and just smile and say, “Let’s just not know!” It was such a foreign concept – but also so freeing… of course – in the end, only seconds later – they couldn’t not know… but it planted a seed in us to embrace the freedom to not know some things… to be less tied to our devices and rest more in the mystery of needing all the answeres all the time! (We can, after all, look it up later!) 😉 Loved this! So glad I stopped by! Thanks, Karilee … Hey … 15 years ago … Even 10 … We did fine not knowing. It didn’t even occur to us to seek it out! I’m with you. Let’s be free! I think it all depends on the questions we ask. The more questions I ask God the closer our relationship becomes. Great points here! So true, Bethany! I love using the Internet for Bible study! So, Dianne, have you been peeking in my windows? I’m a need-to-know girl. Anytime something comes up about which we have a question my brain won’t rest until I *know*. Lately I’ve been asking myself “to what end?” is all this knowledge? Useless trivia stored up in my brain. Do I have as many Bible verses stored up as I do celebrity names and faces? You obviously hit a nerve here and I’m really glad you did! Lol, Shelby. I think God is wooing His kids away from meaningless things. And what a great challenge to remember Scripture instead! Thank you so much for this! I’ve had to say no to some “extra blogging knowledge” that I would love to learn about. But God wants me to focus on the commitment I’ve already made that I haven’t finished yet. Sometimes I just need permission to slow down and not keep up with the latest! Recently a friend told me she starts her day by asking “Lord, what do YOU want me to do today?” God may have a different way for me to use my time if I stop and ask. I’m with you on all the blogging knowledge out there. How I wish I could absorb it all. But we have to follow God’s leading. It will come, in time. Yes! To information overload!! I know you are learning great info with Pin 21. Praying God uses it to expand your reach for His glory!! Thank you, Dianne, for this post! I consider myself a New Blogger and the time spent trying to learn new stuff and trying to read everyone’s blog posts is exhausting! I think trying to be in “the know” can be a form of pride. Ouch.. fingers to myself:) Thanks again for the reminders. I want to Know Him more! God Bless! Your neighbor at Grace and Truth Link up! I understand, Lisa. I’ve been blogging for a while, but I consider myself a “small blogger” (with a BIG message, tho!!). There is ALWAYS something new to learn. And yes, it does take time to read everyone’s posts. I would love to link up with every link party around … but I have to choose carefully which ones fit my schedule best. Your love for the Lord will shine brightly! Thanks so much for taking time to come by and read. ((hugs)) I’m praying God’s blessing on you and your blog as your reach grows for His glory! 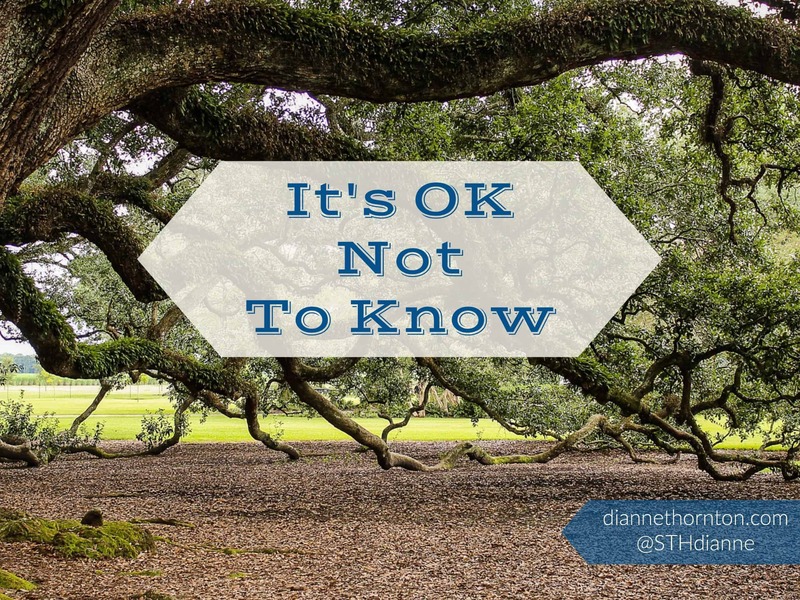 Dianne this post was wonderful and I am so glad it was highlighted this week at Grace & Truth. Powerful thought “”They chose knowledge over life.” A good reminder to choose carefully & wisely every day. Blessings! Thanks, Joanne. You’re right about choosing wisely–every day. And it’s not just about information overload … it’s about how we use our time. May our time bring Him glory!! Amen! Sometimes less is more. I get too easily overwhelmed, so for me I can’t even juggle multiple social medias well. I don’t even like to get on Facebook before Jesus and coffee or my brain is like uhhh….no can’t do it. It feels like it is good in one way, so we can know what is going on i the world, get that info like “now,”…but negative in another way because it feels like we have to fight for rest and stillness. I guess that was another consequence of sin in the garden – that we have to “work for things” now instead of them coming so easily. Praise Him, there is life giving power in pulling the plug and being with the Lord one on one. Thanks for sharing this today – it is a much needed message in our culture. I agree, Meghan. Once I start looking at my iPad … it’s hard to move away from it … once I do … it takes longer to get back into the right heart-frame-of-mind. At the right time and the right place … info is our friend! But it can definitely upset our “stillness”. Thanks for coming by today! Diane, You are talking to me! I am so guilty of being an information hound. I really run into trouble when I start getting frustrated at God because getting answers from Him usually takes a lot more time and effort than Googling data. It’s hard to wait for Him reveal plans that I want to know today. 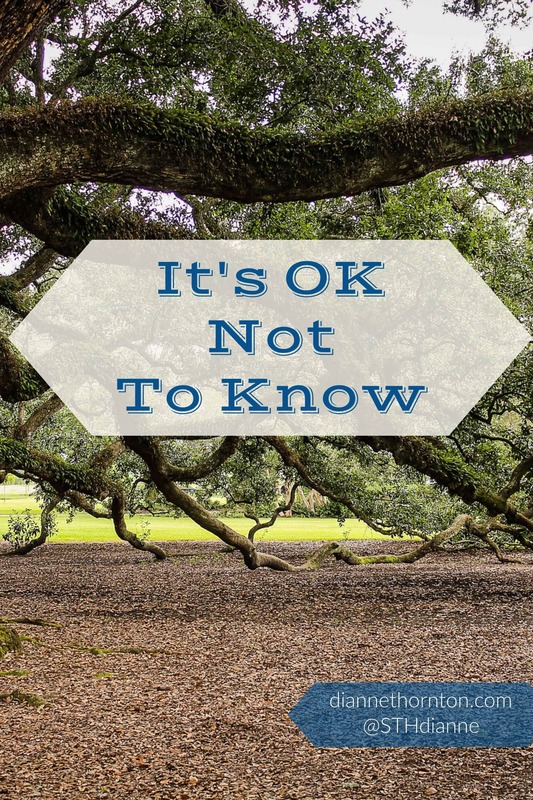 It’s unsettling to not have the answers to so many big life questions that are shrouded in holy mystery because I couldn’t comprehend the answers even if God did try to explain them to me. Thanks for sharing your wise words. You really spoke to my heart and blessed me today.